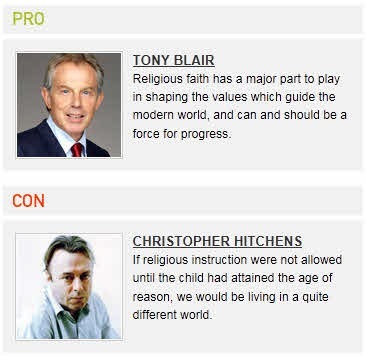 There was a debate this week on the question of whether religion is a force for good in the world with the 2 principle debaters being Tony Blair (Pro) and Christopher Hitchens (Con). You can watch it online here for a few dollars. Christopher Hitchens was excellent as ever. The audience voted before and after with the results below. At the start 57% were already against the motion and this increased to 68% afterwards but those for the motion also increased from 22% to 32% so I think it just proves that both Blair and Hitchens were persuasive. I wish they’d talked a little bit more about existentialism and the transcendent which they only touched on at the end. So the start was Hitchens listing all the bad things in the name of religion – how we should of abandoned the old testament. Blair responded by listing good things done in the name of religion and unfortunately gave the working out of the peace process in Northern Ireland as an example, which Hitchens rightly leapt on – 400 years of religious stupidity. Blair responded that it was normally more about politics and less about religion. Hitchens brings up that Rwanda genocide capital of the world is the most Christian African country and Blair again responds that it’s not about religion. An audience member asks why America one of the most free and most democratic countries can also have the largest and most mixed religious groups. Hitchens responds that the separation of Church and State has left people to not only do what they want and not be persecuted but has also prevented them from being allowed to subjugate each other (saying those religious groups would seem less ‘furry’ if they were in power). One of his comments being “I don’t care what you do, but don’t bring religion into my school or try to convert my kids with your nonsense” but that religions can’t do this because their books tell them to push it into everyone’s faces. Blair agrees with this but again talks about how religion can bring differing sides together. Blair brings up the wonderful things done in the name of religion, and so Hitchens brings up the wonderful things done in the name of communism, but points out many of those people ultimately abandoned communism realizing that it was authoritarian and that they should stand up and be free, and this was the same with the church. Hitchens points out that if it were just about following Jesus he would have less problems with it, but you can’t and have to follow the self proclaimed vicar here on earth the pope. Nice line about not wanting to be part of the flock (or any kind of sheep). Blair and Hitchens then both talk about the transcendent and the possibility of a power outside of human existence – which Hitchens says is OK but you don’t need a religious leader or ancient book or cave for – and points out that these religious books make claims about land and cutting the genitalia off of new born boys with sharp stones which some people take seriously. Sam Harris said recently “it’s not the religious fundamentalists that are the problem, it’s the fundamentals of religion”. Blair then explained that he doesn’t really take the bible literally in that sense and that it was written from the view point of that century – but that it’s the central message of loving others that he takes from it and that it inspires others and is not felt by him as servitude to a higher power. It would be great if that was a 10 commandment (Hitchens line was “Take 10 commands a day in tablet form”). “Do unto other…” is in the Bible but even that was written pre-bible and was around in Ancient Greece and Egypt. Blair was ever the politician and never sounded like he was arguing, he was very relaxed, more so in the second half. Hitchens is looking very pale (poor bloke) – he was very good to do the debate considering he’s got terminal cancer of the esophagus. Some bloggers have unkindly suggested that his cancer is some sort of divine punishment – Hitchens response was that how unimaginative a god to give him exactly the type of disease that someone of his age and a habitual smoker would be prone to get. He wonders “Why not a thunderbolt”. Categories: Musings | Tags: Atheism, Christopher Hitchens, Religion, Tony Blair | Permalink.